Spotting shapes in clouds is a delightful way to pass a lazy afternoon. There's even a society dedicated to cloud spotting. It’s called the Cloud Appreciation Society, founded by Gavin Pretor-Pinney to foster understanding and appreciation of clouds, and to fight “blue sky thinking”. A clear blue sky has always been associated with good, happy weather – a perfect summer’s day, while cloudy skies are regarded as a metaphor for doom. Nothing could be more depressing, it seems, than to have ‘a cloud on the horizon’. Gavin Pretor-Pinney decided that this has to stop. “Someone needs to stand up for the clouds”, he says. So in 2004, he started the Cloud Appreciation Society and few months later launched a website. 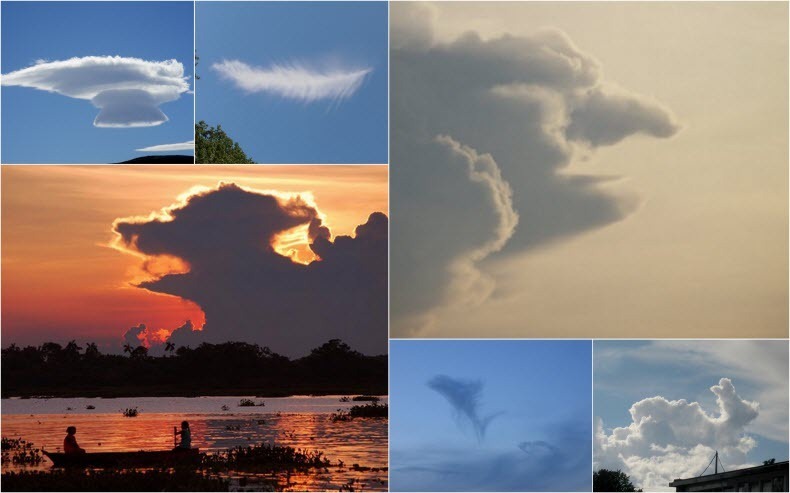 People sent in their cloud photograph, which he put up on the gallery pages for others to look at. The early trickle of submission soon swelled to a torrent. Today, it has over 29,000 members worldwide from 83+ different countries, and many thousands of amazing images.